Installed Rasmussen double side log set. You have many choices when it comes to a contractor to see to your home or business heating and cooling needs. But in Leesburg, IN, it’s simple to narrow your options down to a company with more than 30 years of history in the area: Collier's Heating & Air Conditioning. 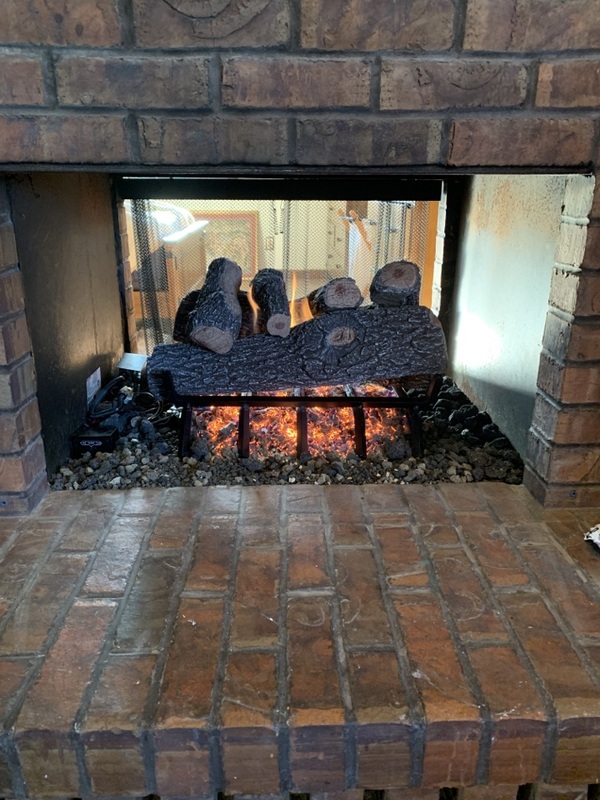 We offer many different services you won’t find elsewhere, such as work with solar panels and geothermal heat pumps, and our Fireplace Shoppe has everything you need for a great home hearth. Contact us to learn more about how we can benefit your house or workplace. Our certified and trained technicians are ready to help, no matter your HVAC needs. Summers in Leesburg, IN can get warm, with averages in the mid–80s from June through August. To deal with these temperatures in your home, you’ll need a powerful and reliable central air conditioning system. Collier's Heating & Air Conditioning has the services to help see that you have that AC, and that it continues to work effectively for many years. We carry numerous types of cooling systems (central ACs, ductless mini splits, heat pumps) and offer 24/7 AC repair service whenever your air conditioner runs into trouble. During winters in Leesburg, your main priority for your home is staying warm and safe. Do you have a dependable heating system to manage that? The best way to be sure is to have Collier's Heating & Air Conditioning working with you. We install many types of heaters (furnaces, heat pumps, boilers) and provide services to keep them running day after day, winter after winter. No matter what assistance you need, from replacing a furnace to tuning up a boiler, trust to our expertise to get the job done right. Are You Interested in Geothermal Heating and Air Conditioning? We understand if you feel a bit hesitant about the idea of using a geothermal heat pump for your comfort. It’s a big step and often feels intimidating. But Collier's Heating & Air Conditioning is one of the leading geothermal contractors in Leesburg, IN, and it’s our goal to make switching to a geothermal heating and cooling system as easy as possible. Talk to one of our geothermal specialists, and you’ll learn all about the benefits of making the change to using a geothermal heat pump. Fireplaces may sound old fashioned, but that’s also one of the sources of their appeal. And modern fireplaces are more energy efficient and safe, as well as helping out with keeping rooms warm. For homeowners who want to enjoy the coziness of a fireplace, we offer service with our Fireplace Shoppe. We carry many wood–burning models, as well as gas log fireplaces and freestanding wood pellet stoves. All our models are from the top brands on the market. Stop by the Shoppe to learn more. At Collier's Heating & Air Conditioning, we provide more for home comfort than adjusting the indoor temperature. We also offer indoor air quality services to balance humidity and remove pollutants. Our professionals will find out exactly what your house requires for improved air quality, and then install the best solutions. These can include a whole–house humidifier or dehumidifier, air filters, air purifiers, and more. Our ventilation professionals also work with ducts to clean and repair them. This protects air quality and improves HVAC efficiency. Harnessing solar energy is one of the most cost–effective ways to provide power to a house. It starts with the installation of solar panels, a job our trained technicians can easily accomplish for you. You may believe using solar energy is out of reach for your home in Leesburg, IN, but our experts at Collier's Heating & Air Conditioning can show you that the job is simpler than you think. Speak to one of our specialists today and find out how we can put the sun to work for you. If you own or operate a business in Leesburg, IN, it is vital you only entrust commercial HVAC specialists with your building’s heating and cooling requirements. This isn’t a place to risk amateur work, or work from technicians who are only familiar with residential air conditioning and heating. Collier's Heating & Air Conditioning is a resource for your commercial comfort and environmental needs. Our technicians are trained and experienced with a huge range of commercial heating, air conditioning, refrigeration, and indoor air quality equipment. Not all commercial HVAC contractors also offer commercial refrigeration work the way we do. It is our goal to see that your business suffers from minimal (or any) disruption whenever you require a new installation, a replacement, emergency repairs, or regular maintenance for your refrigeration equipment. Call us for service for your walk–in coolers, freezers, ice machines, and more. Friendly and knowledgeable service tech. Very thorough maintenance service check. I have never used Collier's before- but I definitely will in the future. I tried calling two other local "emergency" heating services before finally reaching them. I had gotten home late, and the house was already at 50 degrees during a snow storm. Within an hour the man was at my house and then had the heat restored in 30 minutes! It was pretty costly- but for the great service and timeliness it was okay with me. Nick was professional in approach, so gave me confidence in his competence. Appreciate good service from Collier’s. Very efficient and friendly. Great value.